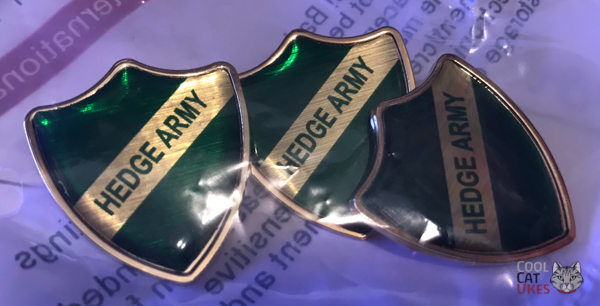 As mentioned in the the unplugthewood podcast #22, and now a 'thing', we have Hedge Army badges available for serious followers of the Hedge Inspectors. Show your loyalty with pride. These badges are like 'school' badges with an acrylic over gloss and a bar and lock pin on the rear. £4.00 each. You can win one - details in the video here, but if you are too late or unlucky, you can always buy one via the links. Order using the buttons below. Please be sure to select a postage to add to the cart, either UK (£1.00) or non-UK (£3.30). One P&P per order, any quantity of badges. You can change the quantity of badges on the checkout page.